The Multi Sentry series is ideal for protecting data centres and telecommunications systems, IT networks and critical systems in general, where the risks connected with poor energy supply can compromise the continuity of activities and services. The Multi Sentry series is available in 10-12-15-20 kVA models with threephase/single-phase input and single-phase output, and 10-12-15-20 kVA models with three-phase input and output and on-line double conversion technology in accordance with VFI-SS-111 classification (as set out in standard IEC EN 62040-3). Multi Sentry is designed and built using state-of-the-art technology and components. It is controlled by a DSP (Digital Signal Processor) microprocessor, to provide maximum protection to the powered loads with no impact on downstream systems, and optimised energy savings. start-up delay function, to restart the rectifiers when mains power is restored if there are several UPS in the system. 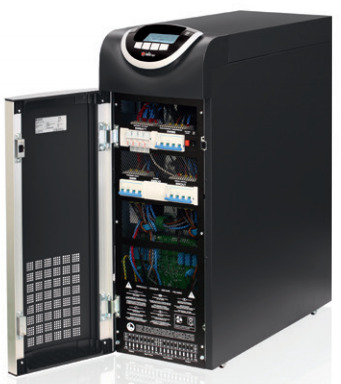 In addition, Multi Sentry plays a filtering and power factor correction role in the power network upstream of the UPS, as it eliminates harmonic components and reactive power generated by the power utilities. Charge blocking system to reduce electrolyte consumption and lengthen the life of VRLA batteries. Recharge voltage compensation based on temperature in order to prevent excessive battery charges or overheating. Battery tests to diagnose in advance any reduction in performance or problems with the batteries. Deep discharge protection: during extended low-load discharges, the end-of-discharge voltage is increased - as recommended by battery manufacturers - to prevent damage or reduced battery performance. Ripple current: recharge ripple current (residual AC component) is one of the main causes of reduced reliability and battery life. Using a high frequency battery charger, Multi Sentry reduces this value to negligible levels, prolonging battery life and maintaining high performance over a long period of time. Wide voltage range: the rectifier is designed to operate within a wide input voltage range (up to - 40% at half load), reducing the need for battery discharge and thus helping to extend battery life. Distributed parallel configuration of up to 8 units per redundant (N+1) or power parallel system. The UPS continue to operate in parallel even if the connection cable is interrupted (Closed Loop). The compact version of the Multi Sentry (MCM/MCT 10, 12, 15, 20 kVA) features embedded auxiliary outlets for intelligent utilities supply. The “energy share” outlet is driven by relays which are customizable depending on the installation or customer needs, making it more suitable for protecting different critical load. On the MSM/MST Multi Sentry version the same functionality is available as optionally. Multi Sentry is equipped with a back-lit graphic display (240x128 pixels) providing UPS information, measurements, operating states and alarms in different languages. It can also display wave forms and voltage/ current forms. A wide range of comunications options are available to ensure global and comprehensive UPS monitoring. Please refer to option table for details. Riello UPS 's social commitment aims to help the present as well as shape a bright future, combining the inevitable need for energy with environmental protection. Riello UPS uninterruptible power supplies power some of the most critical data centres and servers in use today. Within these environments, energy management is critical. Running costs must be minimised without compromising resilience, i.e. the ability to adapt to adverse external conditions whilst ensuring the complete availability of the services provided. 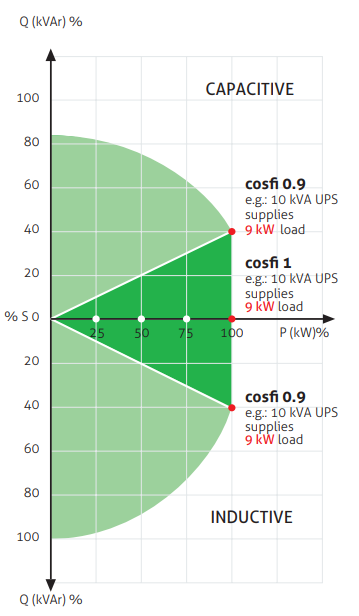 Equipment must operate at the highest possible levels of efficiency to reduce the strain on critical power supplies and minimise the effect on the installation area. Riello UPS models have always been compliant with the highest levels of efficiency in terms of energy protection and are classified according to a scale with 6 levels, corresponding with the efficiency value of the UPS with respect to the European Code of Conduct; this is known as the Eco Energy Level. 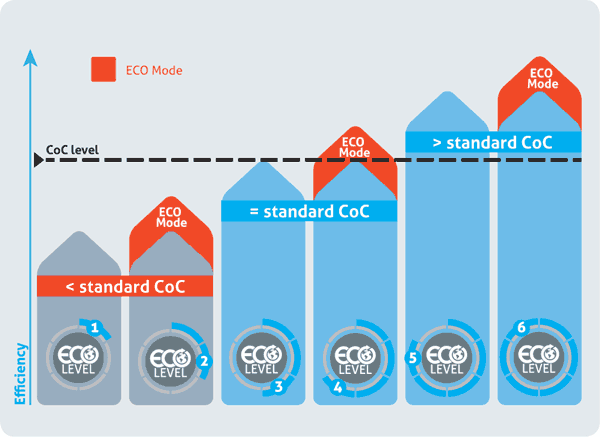 The Eco Energy Level system demonstrates how the most efficient UPS provide energy savings that allow the cost of their purchase to be recovered quickly compared to standard efficiency UPS , as well as how their use leads to significant reductions in carbon emissions into the atmosphere.